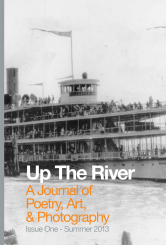 Way back last summer, I posted something about Up the River, the new magazine put out by Albany Poets. At the time, the physical magazine hadn’t been published yet, but you could read my two pieces online. Since then, the print magazine came out. It’s been a while, but I only recently got my hands on a copy. You can order yours here or here, or, if you’re local, just try getting it at one of the many open mics running in the area. Well, for one, it’s prettier in person. There’s a lot of art and photography in the print copy that never made it online. And reading things on paper is nicer than on a computer screen, I’d say. On the other hand, I should have a book of poems coming out later this year, so maybe you should save your ten bucks. I guess you’ll have to decide for yourself.